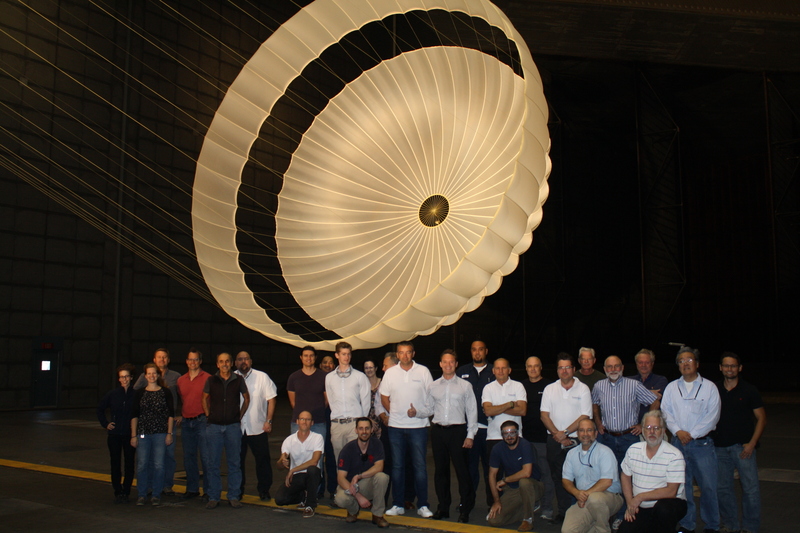 Pictured here are some of the people from ESA, industry (Thales Alenia Space Italy, Thales Alenia Space France, Vorticity, General Dynamics (USA)) and the NFAC test facility with the qualification model of Schiaparelli's parachute. This is a representative model of the parachute that will slow the Schiaparelli entry, descent and landing module as it plummets through the Martian atmosphere. When the module is about 11 km from the surface, descending at a speed of about 1700 km/h, the parachute will be deployed by a mortar. Trailing behind the module at a distance of 27 m, the parachute will slow the module to about 200 km/h (at 1.2 km from the surface), at which stage the parachute will be jettisoned. The parachute is a "disc-gap-band" type - the type that was used for the ESA Huygens probe descent to Titan and for all NASA planetary entries so far. The canopy, with a nominal diameter of 12 metres, is made from nylon fabric and the lines are made from Kevlar, a very strong synthetic material. Tests of how the parachute will inflate at high (supersonic) speeds were carried out with a smaller model in a supersonic wind tunnel in the NASA Glenn Research Center. The full-scale qualification model of the parachute was used to test the pyrotechnic mortar deployment and the strength of the parachute in the world's largest wind tunnel, operated by the United States Air Force at the National Full-Scale Aerodynamic Complex (NFAC) in the Ames Research Center, California.